Rabbi Winer was wonderful throughout the whole wedding process. He was attentive and showed a genuine caring spirit not only during our ceremony but also during the pre-planning for our wedding. He cared deeply about our relationship with each other and helped us to foster good feelings about each other and what we wanted our wedding to be like. He was also very professional while still being warm and caring. Rabbi Winer truly went above and beyond to make our experience memorable and special. Thank you Rabbi Winer! 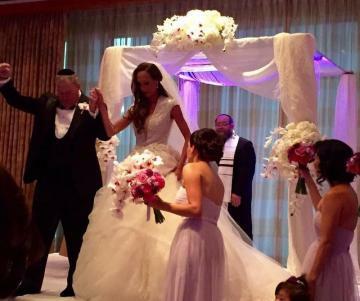 Rabbi Winer did an amazing job performing our wedding. From the moment we met him right through the actual ceremony we felt very welcomed and at ease with him. Rabbi Winer made our wedding day very personal and meaningful. We really enjoyed our entire experience of planning and the actual wedding from start to finish. A wonderful, meaningful, and memorable experience. Rabbi Winer made our wedding beyond special. From start to finish, we felt loved and cared for by him. We are an interfaith couple, and the Rabbi could not have been more accommodating to our wants and needs. He customized the ceremony to really make it about us, and we are thrilled with how it turned out. It was absolutely beautiful. Thank you Rabbi for making our day wonderful. Rabbi Winer did a great job the day of the wedding. We received many compliments about how beautiful the ceremony was. He was very accommodating to any and all requests that we had, wether be it scheduling changes, or coming to the rehearsal so that we could get a little bit more input and assistance from him the day before the wedding. He had plenty of helpful suggestions and was very easy to work with. My husband and I just got married on 10/8/17 with Rabbi Richard! He was amazing through out the entire process and really got to know us as a couple. He added humor and fun to our ceremony and he made us both feel extremely comfortable. We were lucky enough to have him at our reception as well!! We highly recommend Rabbi Richard for anyone! We had such an incredible experience working with Rabbi Winer. He really took the time to get to know US as a couple and make our ceremony personalized. We are an interfaith couple and the Rabbi let both of our cultures shine through in the ceremony. He was very flexible to the point of letting us break TWO glasses since I (the bride) really wanted to partake in this experience too! haha The other reviews about Ricks wife also held true and she did a nice job chanting the Hebrew blessings. Rabbi Winer made our magical wedding that much more so. My now-husband and I interviewed several rabbis before finally selecting Rabbi Winer -- it was important to us that our rabbi got to know us as people before officiating at the most important day of our lives, and he shared our conviction in the value of multiple face-to-face meetings prior to "the big day." We came to love Rabbi Winer so much, we had him (and Lori and Mazel the service dog) as a guest for our full wedding weekend - he is part of the family now! Too many guests to count said our service was the most moving they ever experienced, and we couldn't agree more! We had such a wonderful family dinner, wedding ceremony and reception with Rabbi Winer, his wife Lori and Service dog Mazel. Mike and I are very blessed to have had Rabbi officiate our wedding and hope that he and his family continue to be a part of our lives. With much love and gratitude. Rabbi Winer was a fantastic choice of officiant for our wedding. We received many compliments on how beautiful the ceremony was, including the vows (we opted for the Rabbi to write our vows instead of choosing to write them ourselves). We also enjoyed the fact that his wife was part of our ceremony as she has a beautiful voice, we were glad that he suggested adding her to our ceremony. Rabbi Winer was excellent. We met with him several times through the year and he really was able to add personal touches to our ceremony. For an interrace/interfaith wedding we got so many compliments on how lovely the ceremony was and that it was just right for us. Rabbi Richard Winer was fantastic. He was kind, caring, and a professional throughout the whole process. While searching for Rabbis to officiate my wedding, I was immediately struck by how warm and attentive Rabbi Winer was from our very first interaction. I immediately got a good vibe. 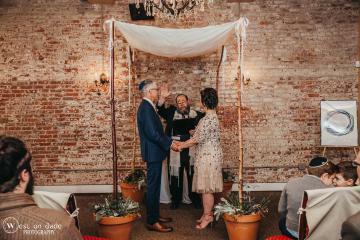 While the other officiants I spoke to in my search didn’t sound interested in spending too much time getting to know my partner and me, Rabbi Winer insisted that we all spend time together, and took a genuine interest in learning about us and our love for each other, so that he could provide the warmest, most Personal ceremony possible. Rabbi Winer attended to our every need, checking in by phone and even popping in for a visit before the wedding to see if there was anything we needed. The ceremony itself was absolutely beautiful! While I wanted a traditional Jewish ceremony, my partner is of a different faith; Rabbi Winer found a way to give me the traditional ceremony I wanted, while also including the non Jewish guests, and bringing them into the traditions via explanations and English translations. He is the perfect blend of warm, funny and knowledgable. He will make the ceremony exactly what you want it to be, and do it with the warmest smile on his face! I recommend Rabbi Winer with flying colors!!!!!! I honestly cannot say enough great things about Rabbi Winer. He is a great man, and an excellent officiant. He takes the time to get to know you months before the big day. He does this not only to offer words of wisdom on how to maintain a successful marriage but to make sure when the big day comes he is able to speak from the heart about you. He certainly made our day very special. My wife and I came from different religious upbringings and he made our interfaith ceremony beautiful. I am still getting comments from people that it was the most lighthearted, and beautiful ceremony they have even been to. We also had the honor of having Rabbi Winers wife participate in our ceremony which I would highly recommend (she has a beautiful voice). We invited them to stay for the reception and it was a pleasure having them meet and spend time with our families. I know my Niece Gabbi has a friend for life with Rabbi Winer and his dog Mazel. All in all, I would recommend Rabbi Winer's services to anyone that wants their big day to be special. Thank you for everything. Rabbi Winer is wonderful! We had so many compliments about our ceremony and it was thanks to Rabbi Winer and his lovely wife (and Mazel the dog too)! 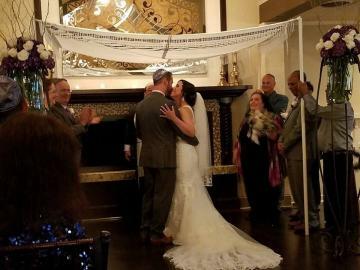 We felt like Rabbi Winer really took the time to learn about us and he made our ceremony feel very intimate and special. I am Jewish but my husband is not and having an interfaith wedding was something that was made extremely easy with Rabbi Winer. He spent a lot of time customizing our ceremony for the things we wanted and helped guide us in the areas we needed help with. We cannot say enough good about him. Amazing person and the best choice for our wedding! Rabbi Winer was an excellent officiant for our wedding! He is very personable and very easy to talk to. The meetings we had leading up to our wedding were relaxed and enjoyable and we really got to know each other during them which made the ceremony much more personal. I would recommend him to anyone looking for an interfaith or Jewish officiant! Rabbi Winer is a wonderful man, very warm and welcoming. He performed a beautiful interfaith ceremony for us, traveling out of state to meet our needs. Rabbi opened his home to fit our schedule and lended his ear via phone (and also email) to answer any questions. It was our pleasure to have someone so kind officiate our marriage. Rabbi Winer was extremely Professional and made our ceremony as personal to us as possible. His wife is a beautiful singer and I would recommend her as well if you're looking for a cantor. He is a very kind person and we enjoyed our sessions with him leading up to the wedding. I hope you have had a relaxing week! I am sorry this is getting to you so late - we are still recovering from the wedding. Justin and I want to thank you so very much for being a part of our special day. The ceremony was beautiful and your wife's chanting was wonderful. We have had so many comments on the ceremony - people saying it was the most beautiful ceremony they have ever been to! It was so wonderful getting to know you over the last year and we truly appreciate all your efforts in making both wedding days very special! I know we will be in touch!